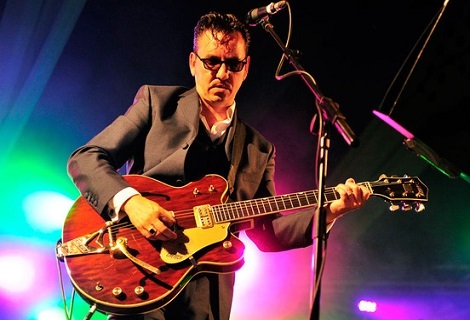 Returning after nearly four decades away with the critically acclaimed Lodestar, Getintothis’ Paul Fitzgerald was at the Philharmonic Hall to witness a performance of the whole album. After a 38 year hiatus, English Folk legend Shirley Collins finally stepped back into the limelight last year, with the release of her Domino Records album, Lodestar. Gathering a coterie of traditional music players around her, they set about selecting a collection of gathered songs together and began recording in her cottage. Years away from the microphone, caused by an attack of dysphonia, in turn brought on by her split in 1978 from her husband, had left her yearning to tell these enigmatic bygone tales again. 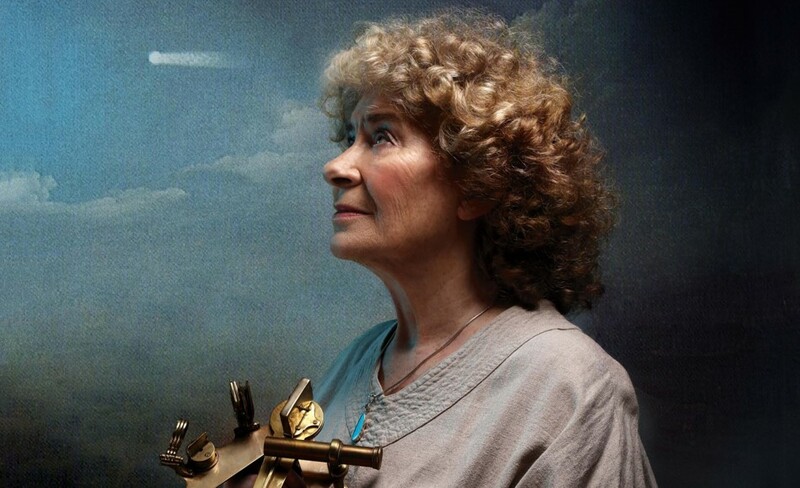 At the forefront of the English early folk revival of the 1950s and 60s, Shirley Collins has worked with everyone from Ewan Macoll to Bert Jansch, and for those nearly four decades, she was sorely missed by folk lovers. Aged 81, she has taken Lodestar on the road, and brought it to a devoted audience at The Philharmonic Hall. The evening felt like a reunion of old friends, happy to be reunited, and keen to catch up from where we left off. To open the show, after an introduction from Collins’ old friend and our narrator for the night, Pip Barnes, Dave Arthur and Pete Cooper took the stage with a short set on guitar, banjo and fiddle. Beginning with an old Dillard Chandler Appalachian piece, and rounding off with a Georgia blues folk instrumental it set the stall out for the rest of the night. Arthur and Cooper would go on to join Collins and the band later on in the show. Following an extended period of PA trials and jiggery pokery with various leads and monitors, the incredible voice and talent that is Olivia Chaney was able to take centre stage. And were we glad for that. Until now, we’d not been familiar with her work, but certainly we weren’t the only ones frantically searching online during the interval. Chaney started on keys, before moving to a resonator guitar for a version of the folk classic The Blacksmith, and finally held the audience in reverent silence with her version of Monteverdi’s Oblivion Soave, her voice, clear and clean, soaring over our heads and around the space, it highlighted the link between Baroque and early Folk, by carrying elements of both. The second half of the evening saw Collins and the band performing the whole Lodestar album, accompanied with video to emphasise the otherworldly weirdness of these dark traditional songs. Songs of love and death. Mainly death actually, the body count on this album being so high. Deaths at sea, infanticide, murderous plots, all gin soaked and haunted, there are few survivors on this album. Washed Ashore, inspired by a simple carved cross in a Sussex graveyard with that plain, anonymous epitaph etched into the wood, imagines the tale of the song’s victims, and evokes their demise. 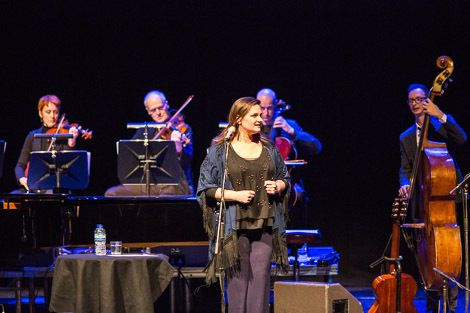 It’s a stark and bleak tale, and Collins delivers it as dry and plaintive as her familiar austere vocal style demands. With scenes of dancing horses skulls, and burning crosses of the village processions of the home counties forming the projected backdrop, the slide guitar and harmonic intro of Death and The Lady led us on another dark journey out down a country lane for a meeting with death, and the conversation that takes place before Death takes her down that final path. She pleads, desperately begging him for more time, offering her jewels and robes as an exchange, but to no avail. Her time is come and she must go. For all the death, drones and pagan weirdness, for all the fire, woe and destruction, there’s no shortage of beauty in the balance too, such as in Collins’ fluent and evocative version of the Cajun French song Sur le Borde de l’Eau, which captivates and beguiles us at every turn. Its a simple arrangement, perfectly poised, and a true standout moment in a night of such moments. Pip Barnes, who talked us through the songs, explaining their provenance and history, brings the evening to the close, by gathering the musicians and Morris dancers together for an extended version of the album’s final song, The Silver Swan, after which he congratulates the Philharmonic audience on their singalong prowess. And after a well deserved standing ovation, the grand lady of English folk music takes her leave. Having Shirley Collins back is a wonderful thing, she too seems happy to be back, and we hope soon to hear another collection of this intriguing music from this accomplished artist.